I once tried to learn how to knit a long time ago from the internet. I couldn’t do it. Who would have guessed that years later I’d learn to knit in another language! I’ve been living in Albania for almost 2 years now. Knitting is crazy here. If speed knitting were an Olympic sport, I’m pretty sure every Albanian woman would qualify. And they don’t even look at what they are knitting. They can carry on conversations and keep eye contact with you the whole time. It’s pretty crazy. I feel like practically every single woman knows how to knit. They knit socks, hats and shirts the most. Not because they are trendy but because they need them for winter to stay warm. Many times, they even spin their own wool. Because it’s cheaper than buying yarn already colored and spun (which you can get for $1.50 here). Me attempting to spin yarn. It’s way harder than it looks. You can see women knitting all the time everywhere: on their porches, on the side of the road, by their fireplaces, near their sheep/cattle as they wait for them to eat. So I figured if I was ever going to learn to knit, surely Albania would be the place. But to be honest, I was pretty scarred from my first attempt to learn. I tried to make a scarf but it was so wavy that I almost got seasick just looking at it. I didn’t really want to go back down that road. But since I wanted to become better friends with one of the ladies I live with, I thought it’d be a great way to spend some informal time getting to know her. She got a huge smile on her face and said of course! I started with a sock. She let me use her needles but when I hadn’t finished the first sock nearly two weeks later, she asked if she could finish them for me because she needed her needles back. 20 minutes later, she had finished both socks for me. 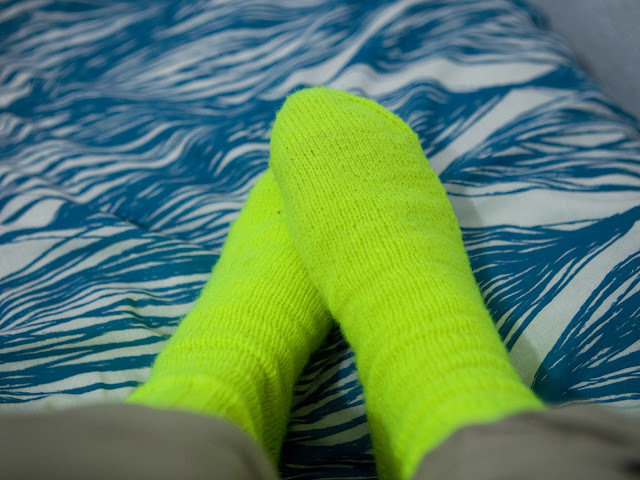 My first pair of socks! Yes. The color is that obnoxious. I didn’t have much color choice. But during that time, she came to my house more to check on my sock’s progress. I went to her house more because I often got stuck and needed help. And guess what. Because we saw each other more, we got to know each other more! And so I started another pair of socks. After I went and bought my own needles so I could knit at my own pace! But I was getting brave. I used two colors! And made lines in them! Much better color. I actually wear these when other people are around. There are two other women who live in the same gated area too. 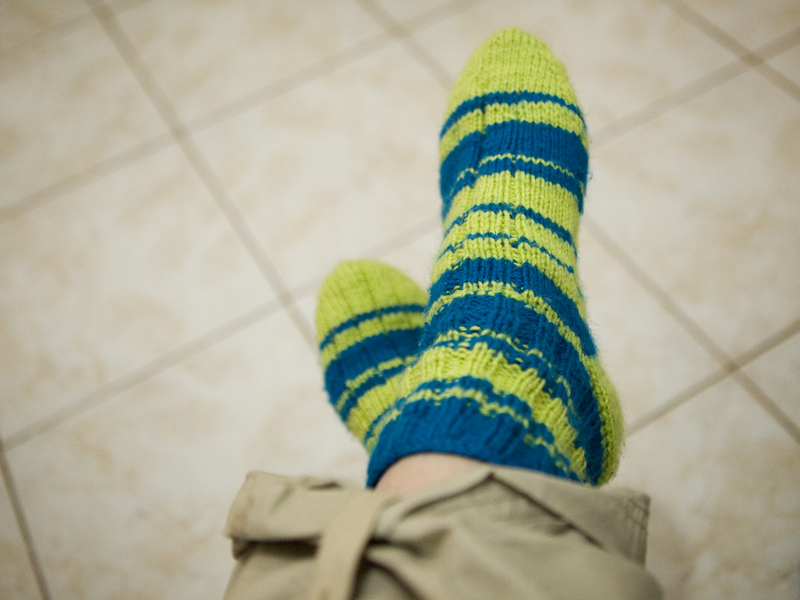 After I got started with my new sock project, one of the other ladies began to check on me. And offer her help. And sit with me while I knitted. So I began to ask her for help too. Then my landlady began to check in on my knitting. And soon, I was recruiting her for help. Before I knew it, my roommate (who was starting to learn to knit at this point) and I would be spending a couple hours several times a week knitting with these women. And guess what happened. We learned about their pasts. We learned about where they grew up. What life was like in Albania as a child in a village. We heard about funny childhood memories. We heard stories about when their kids were younger. We learned more about them. They learned more about us. We connected. We bonded. We deepened our relationships with each other. All because I asked for help for something I wasn’t even sure I wanted to learn how to do. When I asked these women to teach me how to knit, they loved it! Now, anytime people come over, one of the first things they do is brag on my roommate and I because we know how to knit. It makes us more Albanian and the Albanians prouder! 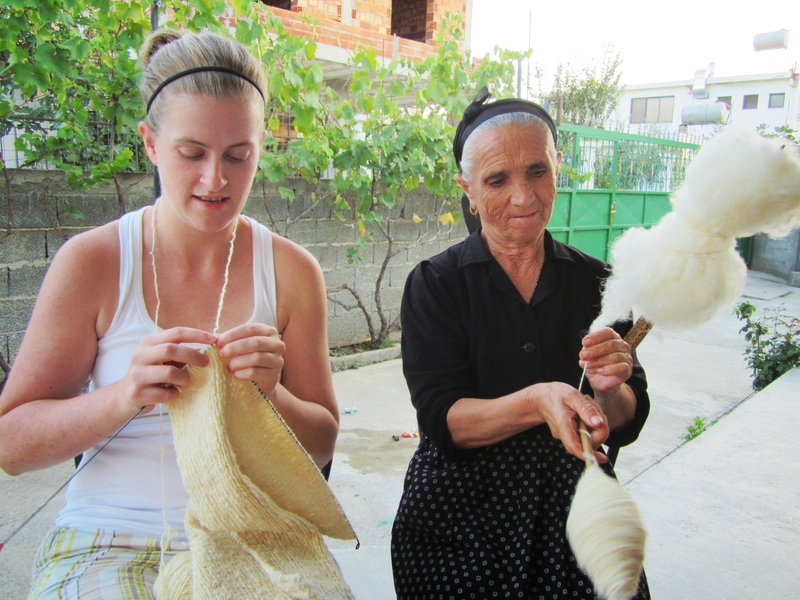 Me knitting with my Albanian grandmother while she spins wool. Never thought I’d be able to say that! Ok, technically, we only know two stitches and neither of us have yet to finish a project by ourselves. So the they use the term “know how to knit” very loosely when describing our capabilities. But they are just so happy they could teach us and share their passion for knitting with us. They don’t really care if we don’t love it as much as them. They just love the fact that we are interested in something they love so much and are willing to try to learn. They know we aren’t good. But they don’t care. They care that we want to learn from them. I know I love to share little bits of wisdom about my passions with people. I don’t care if someone is starting out or just curious. I just love to pass on any revelation or bits of advice about the things I love. But how many times have I missed an opportunity to share because someone didn’t ask? How many times has someone else missed an opportunity to share their passions because I didn’t ask? Maybe instead of offering our help all the time, we should ask for help more too. Chances are, when someone is passionate about something, they will be more than happy to help. And who knows, an acquaintance might become a friend...or three! Who can you learn from this month? This is so relevant to my life, Katie! Since I moved here not too long ago, I think I need to ask and learn from anyone I meet :-) This is such a unique perspective to building community, and I love it. Thank you! Thank you so much for your post! It makes so much sense why asking for help builds relationships and community: people like to feel needed. But it's so hard! Asking for help means you have to allow yourself to need others, and I REALLY struggle with that part. Thank you again for writing, and I hope you post again soon! Beautiful post! Absolutely lovely and relevant lesson. Thank you so much for sharing. Much like our walk with the Lord, it is humbling and healthy to ask for help along the way. We must tuck our pride away and make ourselves vulnerable. It will only help us grow. Best of luck with your knitting and God be with you during your time in Albania! I'm glad it's relatable! Thanks for letting me share! I struggle with asking for help quite often too! Though I have to admit I think it's easier to ask for help being in a different culture :) It's also hard when culture teaches you to be independent and to be able to do everything yourself. But that can drain you emotionally and physically quickly! Since living in such a relational based culture like Albania, I have been able to experience the extreme opposite where people will stop anything they are doing to help you. It is truly humbling! PS You can read about my adventures in Albania over at www.krhawkins.wordpress.com! It is definitely humbling (and good) to ask. For me, often times the pride issue pops up when I am afraid I will look too weak or not "Christian" enough if I have to ask for help or admit I need help. I agree, we need to make ourselves vulnerable and ask for help! What a lovely story. Sometimes it's nice just to take a step back and ask what can we learn rather than what can we teach. This is beautiful. Sometimes life is so achingly beautiful and this is one of those stories that just hits me with that beautiful reality. I loved this! I lived in Albania for nine years, and often admired the incredibly fast knitting style there. WHY did it never occur to me to ask someone to show me how to do it? I am so glad you did.